It’s that time of the year again! The India Couture Week is back with a bang with the top names in the Fashion industry coming together to celebrate the best. Deepika walked the ramp for designer Manish Malhotra who showcased his collection ‘The Persian Story’ at the opening day. 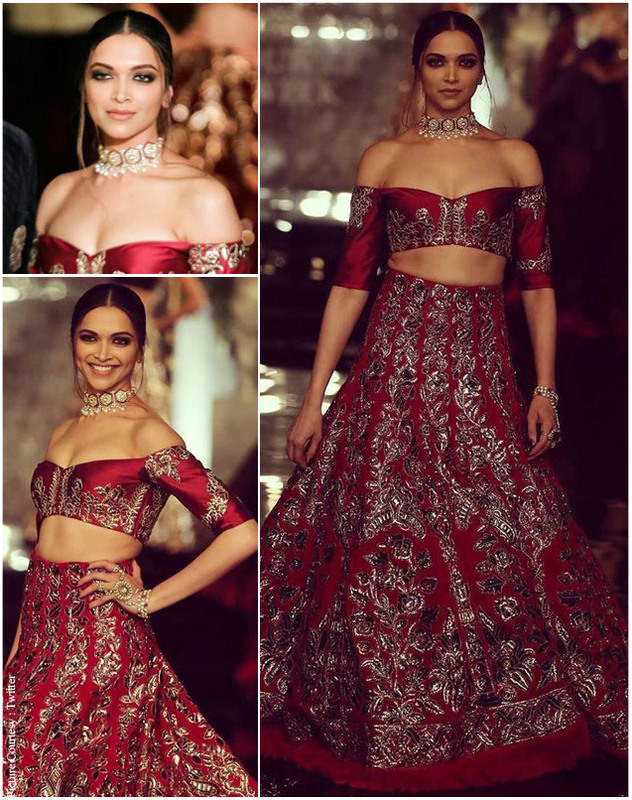 She wore a maroon bridal lehenga and set the ramp on fire. Let’s take a look at her outfit. The fiery actress was the showstopper for Manish Malhotra. She wore a maroon high-waist bridal lehenga with heavy golden embroidery. She carried the three-fourth sleeved off-shoulder choli with elan. source: koimoi.com The beautifully crafted lehenga went well with the pearl and gold jewelry. As for her hair, it was tied in a neat bun at the back with loose strands framing her face. Her smoky eyes added more drama to entire look. Pakistani model, Fawad Khan walked the ramp with this beautiful celeb for the first time. He was dressed like a Pesian Prince. His debut on the ramp in India is another first for this actor-model who has a huge fan following here. The duo sauntered down the ram amidst loud cheers from the crowd and gave a tremendous start to the five-day fashion extravaganza.